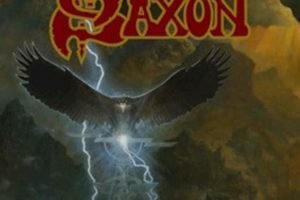 In my late 20’s would be the last time veteran British band Saxon set foot in New England to play live, as Halloween 2000 they would perform at the much missed Station night club in West Warwick, RI supporting their Metalhead record. Since then they’ve done a few short tours stateside… the closest hitting New York City as many promoters fear the drawing power for a sound considered ‘classic metal’, ‘old-school’, or ‘traditional/NWOBHM’. Bolstering their profile on the opening two dates of the East Coast swing would be California’s Armored Saint as well as New Jersey’s Seven Witches – though many ardent supporters feel this potent of a lineup should have been moved downstairs into the more spacious ballroom instead of the smaller, tighter confines of the upstairs. 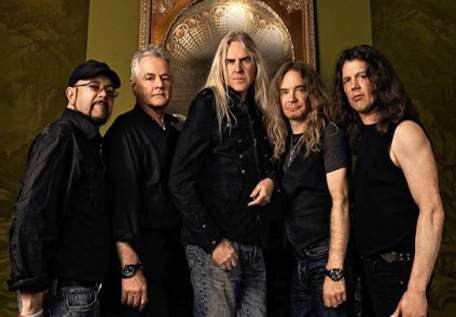 Such is the state of heavy metal in North America… where Saxon can still headline European stages for tens of thousands, only to grind out three digit numbers club to club on the other side of the pond. All for the love of the genre, right gents? Starting promptly as the doors opened at 6pm, the three local bands would get 20 minutes of stage time each (the rewards of pre-selling tickets to their fans for this higher profile show). Centerlink went on first, a decent three-piece pounding out some street level metal that had occasional flashes of thrash. Forevers’ Fallen Grace got a lot of the crowd that filtered in very pumped up, their brand of epic-oriented power metal with folk, traditional, and progressive tendencies going over well if only in 3 songs. Heavy Necker finished the local sets, a trio of musicians that are as much 70’s classic rock oriented as they are Southern and psychedelic in their hooks and melodies – think Led Zeppelin, Lynyrd Skynyrd, and Rolling Stones with a little Clutch in there. 7:30pm meant the New Jersey act Seven Witches would hit the stage. Their sound and lineup has evolved through the years – while still being very much a traditional act, they seem to be reaching back into more of a bluesy hard rock template with occasional heavier grooves and tones for versatility sake. Guitarist Jack Frost is a whirlwind on stage – faces, poses, and exhorting the crowd to pump up the metal feelings as a majority of the sold out crowd would find its way in. Their set list included one new song from their forthcoming The Way of the Wicked album hitting streets this summer, as well as favorites like “Fields of Fire”, “The Answer” and set closer “Metal Tyrant”. Armored Saint had the crowd chanting their name for quite a while in between the set change over. Hitting the stage with the title track from the new album Win Hands Down, it’s nice to see that one of California’s most underrated metal acts through the years received a rapturous response for each and every song. Vocalist (and Boston Celtics fan) John Bush plus bassist Joey Vera are a bundle of energy, showcasing their veteran abilities to get crowd participation and involvement at every opportunity. John would even climb the speaker stacks and sing to the crowd rafters for “Left Hook from Right Field”. The man’s grit and character vocally stand the test of time- as well as the songs. Their 50 minute set included favorites from “March of the Saint” to “Nervous Man”, “Chemical Euphoria” to “Last Train Home”. Also premiering another new song with “Mess” (John quipped about its environmental stance, something even he ‘needs to work on improving’), it appears that long-timers will be itching for the record to hit the streets in a few weeks. Ending with a double shot of “Can U Deliver” and “Reign of Fire”… they marched in and proved they are the real deal still in 2015. Ending the night would be the mighty Saxon. The tour run is a celebration of their 35 year plus recording career, mainly concentrating on the trio of studio albums Wheels of Steel, Denim and Leather, and Strong Arm of the Law. This is my second time seeing the band, and they did not disappoint. Despite technical struggles with a few guitars from Doug Scarratt in the first five songs of their set, this didn’t deter the band from soldiering forward. Biff Byford is a true gentlemen and professional, right out of the gate with “Motorcycle Man”. Bassist Nibbs Carter is another limitless Energizer on stage, banging away, throwing picks at will, and getting the crowd riled up. At times the audience would break out into crowd surfing and mosh pits… which seemed a touch out of place for a traditional / NWOBHM band, but I suppose “Princess of the Night” and “Heavy Metal Thunder” possess a lot of those speed qualities that make people go crazy, right? Outside of “Sacrifice” and “I’ve Got to Rock (To Stay Alive)”, the band would stick to the tried and true classics from the early 80’s. Sing-a-longs were mandatory for “Crusader” and “The Eagle Has Landed”. Sweat poured everywhere for the energy of “Power and the Glory” and “This Town Rocks”. Biff kindly threw whatever leftover water he could on the crowd to cool down. He would even remark that ‘maybe this should have been held in a bigger venue’ because of the sold out upstairs confines. The band pumped out their catalog even this far into the game as if they were playing the pubs in their native UK during the late 70’s – a sure sign that the style is not dead. And judging by the crowd that included everyone from teenagers to 50 and 60 year olds, we can safely say the genre’s health is still strong in the USA. 90 minutes went by so quickly… the band could have played on for more. Hopefully promoters realize that traditional metal still has an audience based on the 400 plus attendees here, and will seek out more tours like this for the future.